PASSEIG DE GRACIA - THE MOST EXCLUSIVE AVENUE IN THE HEART OF THE CITY. THE ABSOLUTE BEST LOCATION POSSIBLE IN BARCELONA. Just look at a map and you can see immediately that an apartment on PASSEIG DE GRACIA, seconds from the famous LAS RAMBLAS is a real find! This is THE address in Barclona. The Studio Loft is part of a beautiful grand building as one would expect from the location, PASSEIG DE GRACIA - THE ADDRESS IN BARCELONA. You enter into a wonderful marble hall with elaborate wrought iron work, stained glass and an extremely elegant staircase. You can see immediately that this is a very fine building indeed. 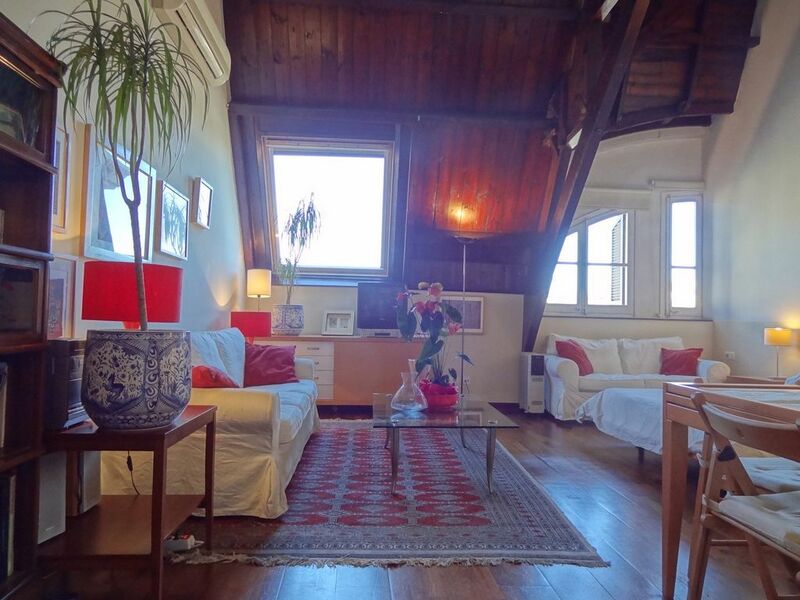 There are two glass lifts/elevators up to the fifth floor where the spacious, very high ceilinged, Studio Loft is located in the 'Mansard' - excellent views. As you enter you immediately notice the space of this very stylish Studio Loft with enormously high wooden cathedral style ceilings - I could easily add another floor but like the feel and character of this home as it is. The bathroom is also spacious and is all white, marble and clean with bathtub, shower, bidet etc etc. The kitchen area has all that is needed for a very comfortable stay - naturally all crockery, cutlery etc is provided. Here you will find an oven, burners, toaster,coffee makers, electric kettle, microwave, fridge, washing machine etc etc. the living area is very comfortable and cosy and naturally fully furnished with armchair, sofas, bookshelves, TV, music centre, cupboard space, dining table and chairs. The sleeping area has a Queen size bed and ample wardrobe space. Naturally it is fully air conditioned and heated. What more can I say? ?This is truly an exceptional property in the absolute best position possible in town!! I consider this to be of very good value. Just seconds from Plaza Catalunya and therefore a two minute walk to the famous Las Ramblas and the Gothic Quarter. PASSEIG DE GRACIA of course has the famous Gaudi buildings, Casa Batllo and La Pedrera PLUS all the best shops in town!! All within literally minutes of the Studio. The Location could not be bettered. To cover some basics - Yes, all linen, towels, cutlery, crockery etc are provided. .PLEASE BRING YOUR OWN FACE CLOTHS AS EUROPEANS GENERALLY NEVER USE THEM. PLEASE NEVER USE HAND AND SHOWER TOWELS TO REMOVE MAKE UP. The supermarket is located just a minute away and is open till 1000pm nightly (except Sundays). I shall be pleased to answer any questions you may have regarding your stay in this lovely mediterranean city and happy to welcome you to this super Studio Loft. AVAILABLE ONLY FOR 1 OR 2 RESPONSIBLE ADULTS OR A RESPONSIBLE FAMILY. This is not a party place! PLEASE DO RESPECT THE PROPERTY AND DO NOT USE THE TOWELS FOR SHOE AND MAKE UP CLEANING. Hello, I am Derek, a freelance European Tour Director and a Londoner. This is an easy question! I chose to live on Passeig de Gracia as it is 'THE' address in Barcelona. Passeig de Gracia is the most elegant and most central avenue of the city. Having lived for two years on Passeig de Gracia, loving every minute of the sheer ease of living within walking distance of everything and being in the heart of such a wonderful city, I decided to buy another apartment, this lovely studio loft in 1998. My original home on Passeig de Gracia is listing 11323 which is also on VRBO. This studio had everything I wanted: The right location, a beautiful period building, unusual ceiling features and a magnificent view of the city. I often stay at this flat when in Barcelona. This is in the middle of everything - a perfect location. Diagonally opposite is Barcelona's main department store with an extremely well stocked supermarket with wet fish counter, butcher , greengrocer and fruiterer - all the best products opposite my studio loft. Arrival and departure is also fantastically easy, I feel spoilt! The Airbus to the airport departs and arrives just outside El Corte Ingles, the above mentioned department store - in other words, opposite the flat. The new Apple store is just next door. When staying here, I very rarely use transport of any kind as I can walk everywhere. In the summer months, the beach is just a 10 minute(if that) metro ride away. This location is ideal for anyone who wants to be central to activities in Barcelona. As a host, Derek is very responsive and welcoming. Derek provided useful suggestions, such as taking the Aerobus from the airport, which are very helpful to someone like me, visiting Barcelona for the first time. The flat was clean, with lots of natural lighting and a delightful view of the Torre Glòries in the distance. Inside it is comfortable with tasteful decor and thoughtful amenities provided. Having a lift inside the building made it easy for me to navigate my luggage (for two week business trip in winter). If you want some place that is easily walkable to Las Ramblas, accessible by metro and other transport, you'll enjoy choosing this hidden gem. Thank you so much for your kind words. I am pleased you enjoyed your stay. Please come back one day. The Very Heart of The City. Walking distance to most sights. Passeig de Gracia - Barcelona's most elegant Avenue, Barrio Gotico and Las Ramblas. This is the very Heart of the City. Best Location.